Whether it is keeping children and pets safe, marking property lines, or just maintaining a high level of privacy, professionally installed fencing can accomplish all these important tasks and more! There are endless types, styles, and colors of fencing to choose from. Blooms Landcare offers quality fencing installation for both wood fencing and iron fencing. We provide outstanding customer service and reliable installation in and around Fort Worth. Wood fencing is the traditional choice for most homeowners. With endless varieties of species, stain, and grain, you can find a wood type to match any home or business. Adding a wood fence is a great way to add privacy and a classic look to your property. Speak to a knowledgeable fencing contractor to discuss the best options available for your particular outdoor space. Iron fencing is a popular choice for commercial clients and homeowners looking for a secure perimeter fence for their property. Iron fences are durable and long-lasting, and they add a modern aesthetic to any outdoor space. There are many choices in iron fencing, including iron and aluminum. 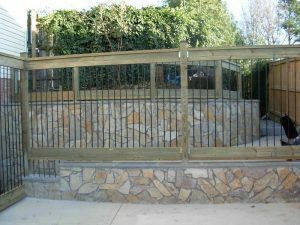 Blooms Landcare has special expertise in all aspects of iron fencing installation and would be happy to discuss your particular iron fencing requirements. For questions regarding our professional fencing installation services in Fort Worth, call Blooms Landcare at (817) 688-5352 today.